I would like to know if you guys see anything that I'm doing wrong. Is it ok to put it right next to the house? What is good to put in the bottom so I don't have to use a lot of soil (I was thinking some big hard Styrofoam pieces that they use for shipping material)? Should I line the bottom with cardboard? Where about do you live and what direction is that side of the house facing? 1. I think the house is going to shade the bed at some point during the day and maybe for the entire day depending on the season. You want as much sun as possible. Also IMO, I don't think you need to make it so high. My raised beds in Phoenix Az are 8" high and work well. No need for cardboard in my several experiences in building these. I would dig out some of your native soil (looks like the sandy dirt I have at my place), fill in with good stuff. Each year you can dig down a little deeper, mixing the native dirt with whatever amendments you are adding. The trough under the bed serves two purposes; it allows more space for roots to grow down (they don't run into a wall of packed sandy dirt) and it also keeps water, soil, and nutrients from being washed out from under the bed (when they run into that packed dirt) instead of sinking down. Hope this helps, good luck! Brent covered it well, but I just will second all that. You don't want your bed right next to your house like that. The house will shade it a lot of the time. Most of the things you probably want to grow want full sun, defined as 6-8 hours of direct sun a day. And it is not good to have something you are going to be watering right next to your house foundation. And there is no reason to make it that tall. Put a fourth side on it (which you can do with the boards that are currently making it tall) and get it as far away from the house as you can for best sun. All the above. Ideally the bed should get at least 6 hours of sun and face south. Plant taller plants on the north end so they don't shade plants behind them. A deep bed is nice if you are planting things with deep roots but it can be expensive to fill anything that deep. On the plus side a tall bed is easier to work standing up although you will probably have to use small tools. I am too old to climb past the first rung of a ladder. The length of the bed is fine, most people find 8-10 ft beds to be a good length and no more than 4 feet accross and accessible on all sides, so you will be able to reach across without having to go into the bed. Non- treated wood should be used, but rot resistant wood like cedar or redwood is better. I build my bed out of hollow tiles. It is easy to build without many special tools and I don't have to worry about rot. The wall is south facing and I also live in Phoenix. I it so high at my wife's request. She wanted it high so she wouldn't have to get low. I planned to put some plastic sheeting between the house and dirt and maybe angle it away from the house. I'm not worried about damaging the foundation unless we over water a lot (I could be wrong). I would like to keep it tall. Would putting those big Styrofoam blocks in the bottom be bad (chemicals from the Styrofoam)? I wanted to put something lightweight in the bottom so it would be easy to take down the garden bed later down the road. I also had planned to have a sail shade over the top of it because the Arizona sun is no joke. I see a lot of my neighbors have shade over there gardens. Personally, I would not use styrofoam due to chemicals as you said. I would have suggested hugelkultur, but I have heard that this is not always recommended in the warmer, south, and definitely iffy when adjacent to the house. -- but if interested, both I and another member rairdog have recently posted threads about our hugelkultur bed experiments. Note, too that by putting non-growing medium in the bottom, you block the roots from reaching the soil underneath, which will counteract some of the benefits of raised bed -- particularly, in your case, the bed will dry out quickly. Watch that you don't make the bed too shallow for plants you want to grow. Yes, as you stated AZ sun is no joke, however its not the hottest three months of the year that are a concern. You want FULL sun for the other 9 months when you are actually growing most of your veggies. Remember, you can always take away sun, but you cant add it. If you are trying to hold something through the summer, you can put some shade cloth over it. Before I built my first two gardens, I read the book mentioned below and it saved me a lot of wasted effort later on. Everything you need to know about gardening in Phoenix is in that book. "Desert Gardening: Fruits & Vegetables: The Complete Guide"
I decided to keep it next to the house. I will wait till the summer to put up the shade. I think I will use stacks of cardboard to fill the bottom unless anyone else has a good idea for a filler. My next steps are to cut those 2x4's off that are protruding skywards and start filling it. I'll try to post updates of my progress along the way. Also let me know of any more filler ideas. I lived in Phoenix area 3 years. They have nice sandy soil but it needs lots organic material and fertilizer. I planted my garden in November if the 2 weeks of cold did not kill it then it did good until late May. If my garden froze I planted again later February after cold weather. I had a garden hose irrigation system with lawn sprayers I turned it on for 15 minutes every day at sun down. Tomatoes, beans, squash, bell peppers, broccoli, chard, Chinese cabbage, sweet potatoes, melons all did good. I had a black color sun shade for the garden for June to Sept everything died anyway except melons and sweet potatoes they love it hot. Best melons I ever grew we had so many we could not eat them all. There is a good place to buy plants at Glendale exit and west side of 202 farm supply store. Put a lot of peat moss in your soil about 6 inches and till it in. I bought a Lowe's garden tiller it worked great for tilling the peat moss into the soil. My Arizona garden had 15 foot long rows with 9 rows 32" apart. AZ weeds were a nightmare to deal with they grew so fast in that nice winter weather. Lowe's has palm tree fertilizer, cactus fertilizer, citrus fertilizer, it is all low numbers and odd numbers. Best thing I could find was 8-8-8. No one sells ammonium nitrate in AZ. Your tomatoes, bell peppers, squash will all need lime I experimented and found about 2 large hands full of cement in a 5 gallon bucket of water works good but let it set for a week before you put it on plants stir well every day. I never could find anyone in AZ that sold lime. I have use raised beds 30 years ago but I'm not a big fan of them. They only need to be about 6 to 8 inches tall, long as you want but only 3 feet wide. Here is a pic of nice raised bed I found. The wet soil against the house will cause a problem even with a liner. Liners leak. If you were to fill the bed with soil it would also need to be reinforced because of the weight of wet soil against a wood wall. Also planting so close to the house things like ants will try to get into the house. You should consider on your next bed to build a smaller box 2-4 ft wide and 10-24 inches deep and 8 ft long. You can use a sheet of plywood for the bottom and line it with a waterproof sheet (pond liner). Put drain holes on the narrow sides and you can raise the height by putting the box on stacked hollow tiles. 2-3 blocks high. that way you can sit on a chair and garden. Attached verticles or holders for a hoop structure. That way you can use the verticles to support a trellis, shade covering, plastic or phylon. I personally don't think putting cardboard under thesoilwould be such a good a idea, beacuse the cardboard will get wet from rain and you watering the plants and will overtime loose it's structure and become wet and colapse. So I think it would would better if you used bricks instead. LOL. What rain. It only rains 2 times each year in Phoenix area. It rains more in the east valley 45 miles from Phoenix. When it does rain it is like all the rain that did not come down in the last 9 months falls all at once in 1 hour. 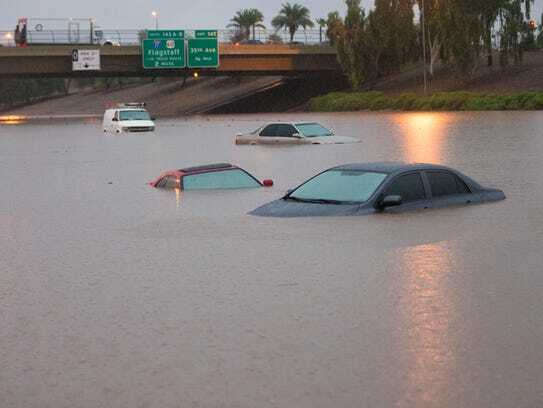 AZ has 2 rain seasons July and winter about Nov or Dec . Last summer it rained so much in 1 hour I-10 was under several feet of water. Water was 8" deep in the street in front of my house people were kayaking and canoeing in the street. 2 hours later sun was out and you could not tell it had rained. All the city street storm drains run into the irrigation ditches. The dry river bed 3 blocks from my house is 1/4 mile wide, it was 20 feet deep with water and water was moving along 45 mph. 3 days later river was dry again. All that river water came from the mountains near Flagstaff. That is why there is a 30 foot levee both sides of the river, fences both side, signs every 100 feet telling you to stay out of the dry river bed. I saw the water come thought the river it was dry one minute then 30 seconds later it was 6 feet deep and 2 minutes later 20 feet deep. If you have your raised bed under the roof of your house you need to be prepared for a water fall your whole raised bed will be gone. I guess I better move it then! I really don't want to though. I cut those vertical 2x4's off I was going to use for the shade. I'm going to move it at least like 4 foot from the wall and make it shorter. Yes, I think moving it is a good idea Good thing you didn't add any soil in yet! I made some changes today. I moved it away from the house and made it shorter. I also put up the shade to see if it would work for the summer. Now I need to find a way to fill it. I've already put more money than I wanted into this project so I hope I can get a good deal somewhere.